What is better than a grilled cheese? Not much! 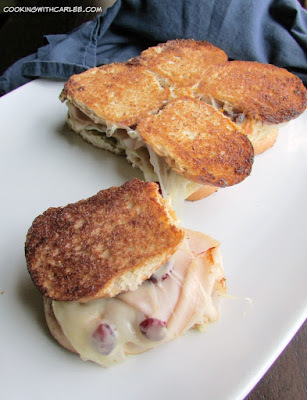 These sliders are snack size, butter, golden, cheesy and have pesto, dried cranberries, turkey and plenty of gooey cheese! Sometimes a grilled cheese sandwich is more than a grilled cheese sandwich. To be honest I enjoy even the simplest grilled cheese. You know the kind, the old childhood favorite of a slice of american cheese sandwiched between two slices of white sandwich bread toasted with a bit of butter. Of course you could serve it up with some tomato soup and really go for the gusto. I mean, you might as well for old time sake and I wouldn't blame you one bit. There is something about the buttery toasty simplicity of all that makes me hungry just thinking about it. But sometimes you want something a bit more. There are so many different flavorful combinations you could put together. Whatever your favorite sandwich is, there is a pretty good chance it would be better grilled up. That leads me to my toasty taste combination. I was toying with a few different ideas when inspiration struck. My friend, Tish, used to make a delicious sandwich. 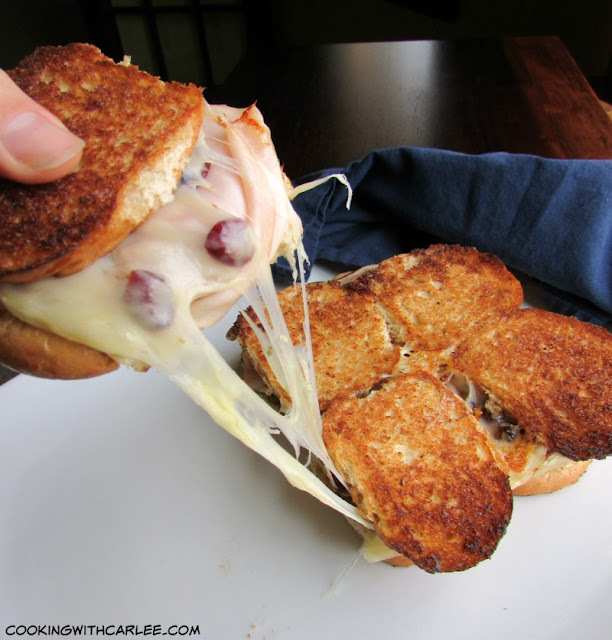 She put a schmear of mayo, some pesto, plenty of turkey, some cheese and dried cranberries all on some hearty bread. It sounds like quite the combination, but it really works. The sweet cranberries, fresh herby pesto and all that turkey. I thought it would make a perfect grilled cheese! Then the wheels really got turning. What if I did it on smaller rolls and made sliders. Now we were firing on all cylinders. My grocery store has a nice selection of fresh baked breads and rolls. I wanted something whole wheat and they had perfect little cocktail buns that fit the bill nicely. So, I picked up the rest of ingredients and headed home to make something delicious. I am glad to say it was every bit as good as I envisioned! To be honest, I wasn't sure what my husband would think. He isn't usually big on sweet in his savory food but he ate four of them and complimented them every few bites. He said he'd happily write a review if I needed one. So I'd say it was a winner all the way around. If you are a fan of different grilled cheese recipes, maybe you'll like ham, apple and sharp cheddar grilled cheese or honey pear and brie grilled cheese. 1. Preheat a griddle or electric skillet to medium. 2. Slice the buns in half, keeping them attached if possible. Turn them inside out and spread pesto on the inside of half of the rolls. 3. Sprinkle with cranberries. 4. Put half of the cheese on top of the cranberries and the other half on the other side. Put the turkey between the layers of cheese and put it all together. 5. Spread butter over the now inside out rolls and place on hot skillet. Cover if possible to allow the cheese to melt. When the bottom is golden brown, flip the sliders and continue to cook until the cheese is melty and the bread is toasty and golden. Oh my! Turkey sandwiches are my favorite of all time, but add grilled cheese? I can't' resist. These look awesome Carlee! It's a match made in heaven! Thanks, Jessica! Great flavors in those sandwiches and I love the idea of using slider buns. They would be a fun addition to a game day buffet. They would be perfect for game day! Thanks, Wendy! Happy Monday girl! Getting ready to head to the airport but checking in first with my faves. 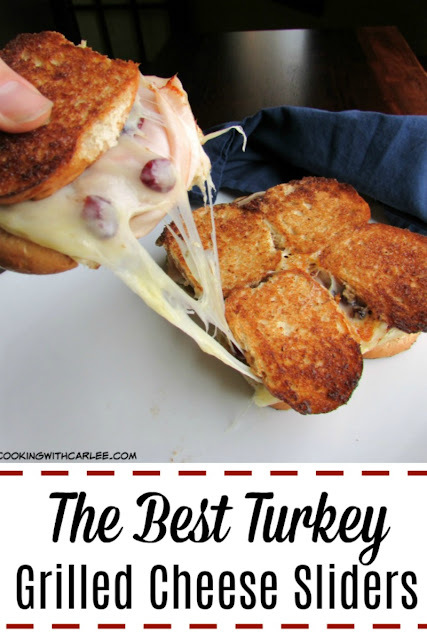 Love these, turkey is my husbands fav and I am going to make these for him this week! I hope he loves them! Back to reality, huh? Darn! Sounds like a tasty combination! Thanks for joining in the grilled cheese party. Thanks for putting it together, Caroline! This would be the absolute best leftover Thanksgiving sandwich. Or anytime turkey is around! It would be WONDERFUL with Thanksgiving leftovers! Thanks, Sue! Oh my gosh! Those look amazing!! I am definitely trying those. Thank you! They are definitely worth making! That looks so good! All that gooey cheese...yummy! There is just something magical about melty cheese, isn't there? OH MY! Where has this sandwich been all my life? 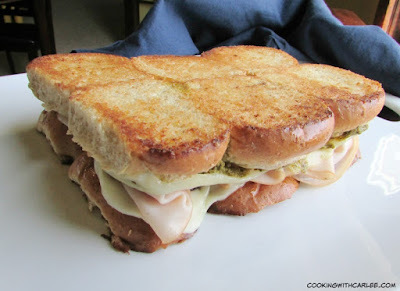 I love grilled cheese so much and pesto on sandwiches is always a good thing :). I'm so hungry now! Thank you!! These are definitely going to be on a regular rotation here for a while! Thanks! This sounds so great, I want to make it. Awesome! They look delicious. Those cranberries are very intriguing. They add that little bit of sweet/tart bite. Thanks! I love the combination for these sliders! Thanks so much for sharing your awesome recipe with Full Plate Thursday. Hope you have a fantastic weekend and come back soon! Yum! This recipe looks amazing. Pinned and sharing. Thank you for joining us at Family Joy Blog Link-Up Party. I hope you will join our next party starting Sunday at noon EST. Thank you so much, they were definitely a hit here! Perfect, I can' wait to try them. Turkey is my favorite!!! I just love this flavor combo and I hope you do too! It's hard for me to get excited about a grilled cheese sandwich, but Carlee really outdid herself with these! They even looked easy enough to make that I could have done it, provided I had someone to buy me all the ingredients.